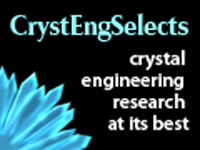 Remember you can keep up to date with all the latest news in crystal engineering by liking us on facebook, following us on twitter or signing up to our e-alert service. 2D and 3D coordination networks with fullerene guests are promising candidates for superconducting materials, with potential applications in gas and information storage. Edwin Constable and colleagues at the University of Basel, Switzerland have reported the intercalation of a fullerene molecule into a network containing octahedral nickel nodes. Using a layering technique, crystals of 1,2-dichlorobenzene and fullerene templated nickel coordination networks were grown and characterised by IR spectroscopy and single crystal X-ray diffraction. The encapsulation of fullerene results in the assembly of [3 + 3] macrocycles, connected into 2-dimensional sheets through the nickel nodes and fullerene-free [6 + 6] macrocycles. Read the full paper to find out more, and to see the pretty structures! Solid form informatics is the use of knowledge-based techniques to evaluate and analyse structures, as well as to predict properties. Identifying solid forms of drugs with suitable physiochemical properties and reducing the late-stage appearance of additional drug forms are very attractive financial prospects for the pharmaceutical industry. In this CrystEngComm advance article, Peter Galek and colleagues at the Cambridge Crystallographic Data Centre use a series of tools available in the Cambridge Structural Database System to analyse the 500,000th structure, deposited by Sridhar and Ravikumar (CSD Reference Code: EFEMUX01). Lamotrigine is an approved drug (marketed in the US as Lamictal) for the treatment of bipolar disorder, with considerable anticonvulsant activity. By using a comprehensive series of molecular, intermolecular and supramolecular analyses, methylparaben is identified as the optimal candidate from five pharmaceutically acceptable co-formers for lamotrigine. This correlates well with experimental data previously published by Miranda Cheney and colleagues, confirming the team’s prioritisation of potential conformer candidates for lamotrigine through detailed assessment of shape complementarity and hydrogen bond propensity. The reknowned capabilities of TiO2-based materials in photocatalytic oxidation of organic pollutants and in photoelectrochemical conversion of solar energy are inherently limited by the poor quantum efficiency of titanium. Research in this area is targeting improved generation and separation of photoinduced electron-hole pairs in TiO2 in order to enhance photocatalytic activity. In this CrystEngComm Advance Article, Mingyi Zhang and colleagues at the Northeast Normal University in Changchun, China, report the synthesis and characterisation of a series of Bi2MoO6 nanostructures grown on TiO2 nanofibers. These hierarchical heterostructures demonstrate improved photocatalytic activity due to the narrow band gap energy of Bi2MoO6 which be easily excited by visible light to induce the generation of photoelectrons and holes. The novel synthetic route to these nanofibers combines both the electrospinning technique and the solvothermal method in order to tune the coverage density and morphology of the nanostructured Bi2MoO6. The hierarchical heterostructures exhibited a high visible light photocatalytic behaviour for the decomposition of Rhodamine B, indicating potential applications of these nanofibers in wastewater treatment. Find out more about these Bi2MoO6/TiO2 nanofibers in this CrystEngComm Advance Article. You are currently browsing the archives for the CrystEngSelects category.